Werner Herzog had started to direct movies in the 1960s although with relatively limited sucess. His output of documentaries and art-house pictures had won critical acclaim but left most audiences cold. 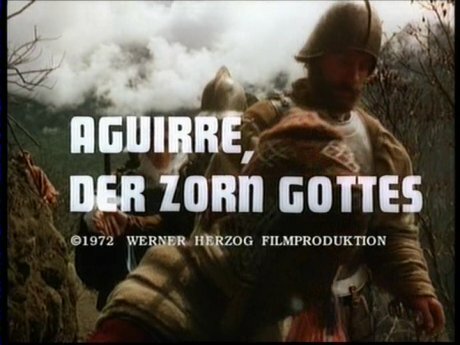 With Aguirre, Herzog created his first genre picture, and the first film that would win him widespread public fame. Lope de Aguirre was a real historical figure, Herzog chanced upon a discription of him in a book and wrote the screenplay within a couple of days. Little is known about the real man, only the names of those on the expedition, the fact that he overthrew Ursula and eventually sent a proclamation unseating King Phillip of Spain. Since the film was actually shot in the Peruvian jungle, the script was continually adapted to the situation as it developed - this works very well, allowing a number of unpredictable elements to be worked in and giving it a greater level of realism. The storyline is very simple, it does not suffer from awkward subplots or unnecessary characters - this does mean that most of the characters remain merely extras with the focus remaining on the lead characters throughout, but it helps to keep the pace moving. Uniquely, the film actually slows down as it progresses, representing the confusion and lack of direction the group have, culminating in a wonderfully anti-climactic and enigmatic ending. Shot with a single 35mm camera entirely on location, Aguirre has a very realistic, almost documentary-like feel to it that really helps to emphasise the scale and effort of the production. There is not a single studio set or optical effect used in the entire film, even during the dangerous 'rapids' sequences. This realism however is broken up with some curious stylistic moments which gradually become more obvious and surreal towards the end. Despite the tight budget, the costumes all look very realistic and despite Herzog's often deliberate use of anachronism, this film always remains authentic to its period. Like most of hisfilms there is a very dreamlike ambience throuhgout, aided by the powerful and mystical soundtrack from Florian Fricke/Popul Vuh. For most of the film, the only actor you notice is Klaus Kinski. As with most of his best performances, he plays a man bordering on the edge between visionary and lunacy in a way very similar to himself - his simmering insanity throughout the film is expressed with utter genius. The rest of the cast are mostly minor character actors but they all seem to 'get' what Herzog is aiming for and fit in very well. Simply put, Aguirre: The Wrath of God is one of the best movies ever made - avoiding the unnecessarily long run-time and hence the dragging plots of most 'epics' and boasting an authenticity and immediacy that studio work could never capture. The film is a pure work of art and comes highly recommended to everyone - this is a must see film and a perfect place to start an discovery of Herzog's impressive oeuvre. Directed by anyone	interesting? Werner Herzog - one of European cinema's best directors who conveys a powerful artistic vision in all his films. Any gore or violence ? Several killings, nothing too violent. Good soundtrack? A powerful and haunting score from Florian Fricke that really builds the atmosphere. Who is it for? This amazing film is recommended to all fans of non-mainstream cinema and is a superb place to start exploring the works of Werner Herzog. The print is of a good quality, with minimal damage but there is a general softness to the image (probably due to an NTSC to PAL transfer of the DVD). There is a blue line just off the edge of the image on the left for most of the film, visible on some of the screenshots, that can get annoying. Audio German 5.1 and 2.0, English mono. All tracks sound good, the German tracks have decent stereo seperation but the 5.1 track is artificial and rather pointless. Availability Only available in the Herzog Kinski collection boxset..
Other regions? Also released in the US by Anchor Bay, same extras but the print is better quality (lacks the softness here). Cuts? Fully uncut. German language print. Wonderful directing and acting with an effective plot makes this one of the best films of all time. Highly recommended. Not the most impressive print, although always watchable (the R1 is better), the audio commentary is very interesting. All text in this review written by Timothy Young - 12th August 2006.